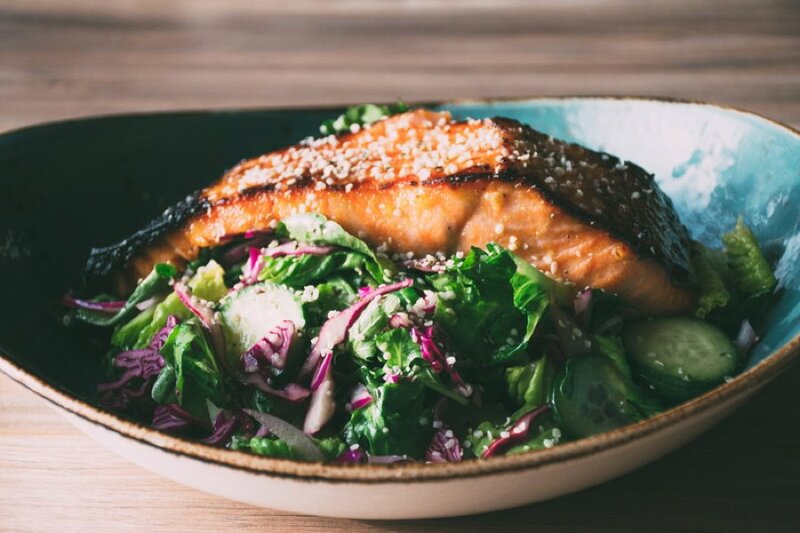 let me tell you about our new favorite fast and flavorful dinner favorite; garlicky miso marinated salmon. you see, I’ve been on a bit of a health kick lately. doing a little experiment by eliminating a few things from my diet to see how that makes me feel. going one month strong with no refined sugar, no gluten, and very little dairy + grains — and I feel pretty dang good. of course there’s moments where I’m like, “ugh! no ICE CREAM?! am I crazy?” but then I find an awesome resource like this woman’s fine blog, bare root girl, and my faith in the healthy eating + mindful indulgence combo is restored. I haven’t made it yet but that salted caramel cheesecake recipe that she has over there? ohhh yes please. I promise to tell you whether or not I could even wait for it to freeze how it turns out. but anyways, back to this banging salmon recipe. seriously you guys, it’s pretty amaze. it’s saved me from caving in and running up the street for some (so not gluten/dairy free) spicy bolognese rotini pasta more than once. which is saying a lot. and the cherry on top here is that the salmon is SO easy to make. like SO SO easy. wash and debone your fish, whisk up the marinade + and plop your filet (of any size! feed 1 person or 8) and let it anywhere from 30 minutes to 8 hours (aka while you’re gone at work dreaming about your delicious dinner waiting at home). fire up the oven to broil status and pop it in until you get some nice caramelization going on top, reduce the temp to let it finish cooking and you’ve got a beautiful, flavorful piece of fish ready in 10 minutes flat. maybe a teensy bit longer if you have a big filet to serve a crowd. 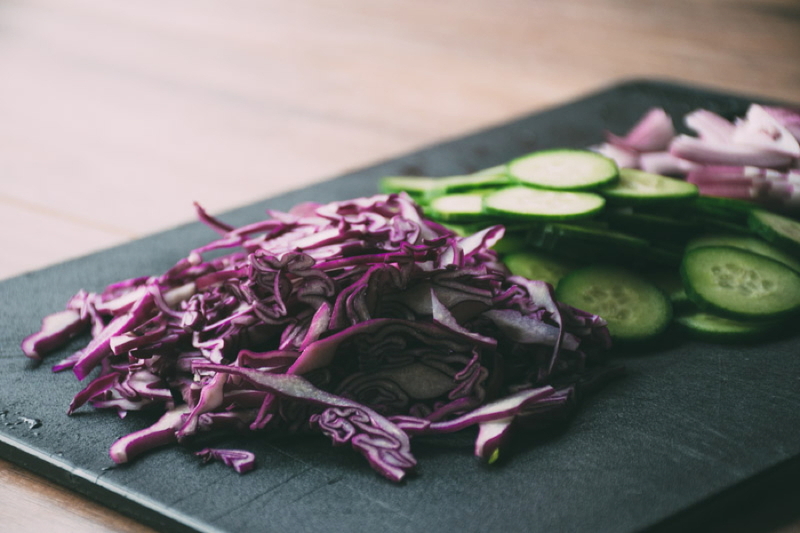 and while it’s cooking you have the perfect amount of time on your hands to throw together a veggie packed salad. one super awesome thing that I’m learning through this experiment (besides my body feeling good) is that we are not defined by the things that we claim attachment to. I am a midwestern girl who LOVES cheese. like a(real super)lot. and that’s who I have always “been”. but that doesn’t mean I have to be a midwestern girl who eats cheese. I get to redefine that at any moment that I choose. when we give ourselves a chance to survey our health/body/energy levels and can recognize some things that may or may not be serving us, not the identity that we claim to have, but the “us” that’s underneath all of those labels that we’ve given ourselves, then we have the chance to transform our human experience. and the even more awesome thing? this mindset can be applied to all areas of our lives. which is pretty damn freeing and empowering. 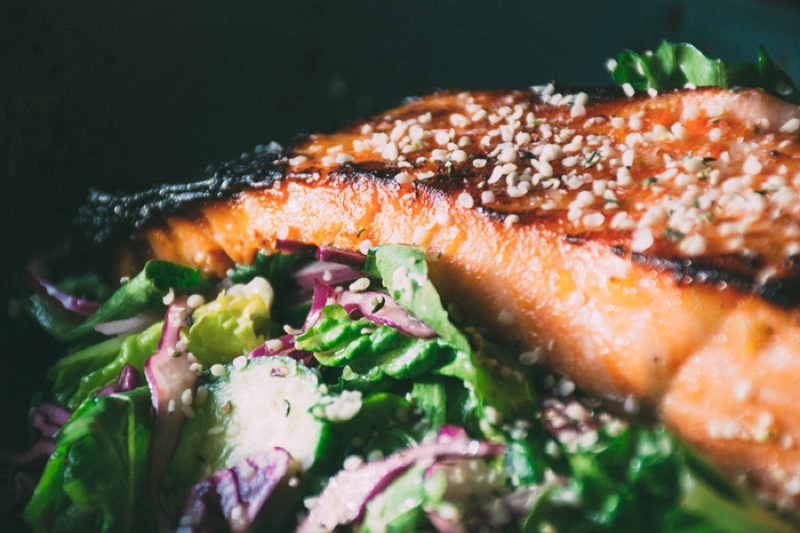 kind of like this garlicky miso marinated salmon with a big salad. bam. healthly body + mind baller status achieved. 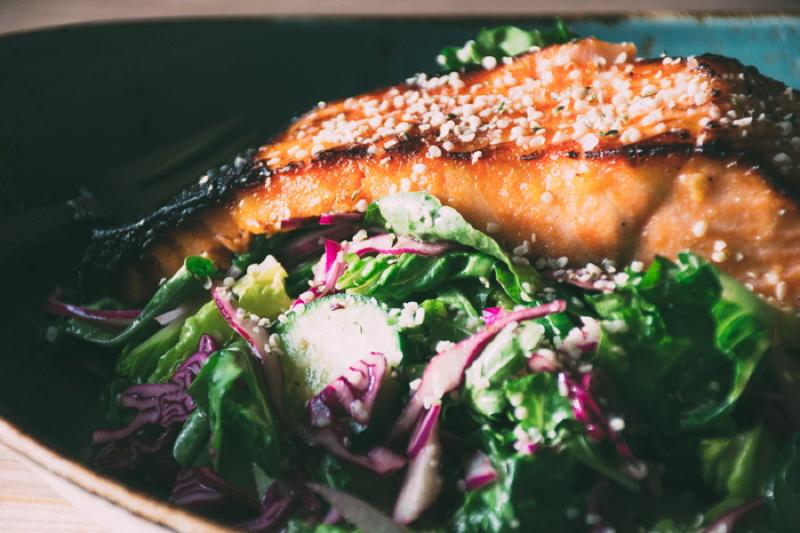 a mega healthy and flavorful recipe for garlicky miso marinated salmon with a big salad of fresh romaine and arugula, cucumbers, red cabbage and a lime and olive oil vinaigrette. whisk all marinade ingredients together in a large bowl and add salmon filet, turning to coat. 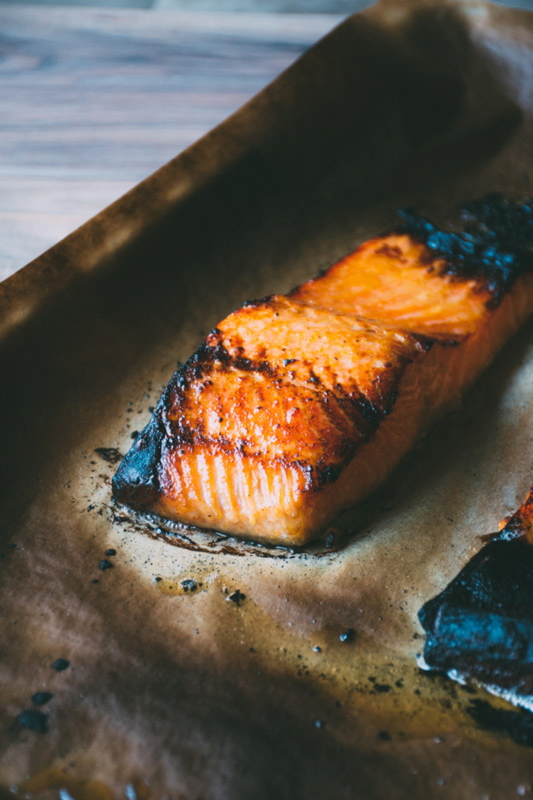 leave salmon flesh side down to marinate for at least 30 minutes, up to 8 hours. place salmon on a baking tray lined with parchment paper and broil for about 4-5 minutes, or until starting to nicely brown. watch closely throughout this time as broiling temperatures can vary from oven to oven! take salmon out and check for doneness. if not yet cooked through lower oven temperature to 425, and cook for an additional 2-3 minutes and check again. it should be done by this point, but if not you can put it back in for another minute or so until it’s cooked through. 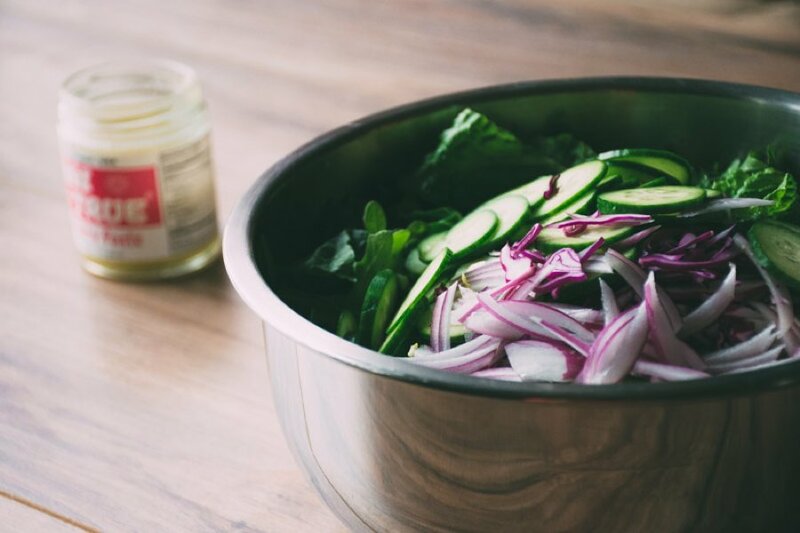 prep salad ingredients and whisk together lime juice, olive oil, honey and sea salt in a small bowl or shake in a jar. 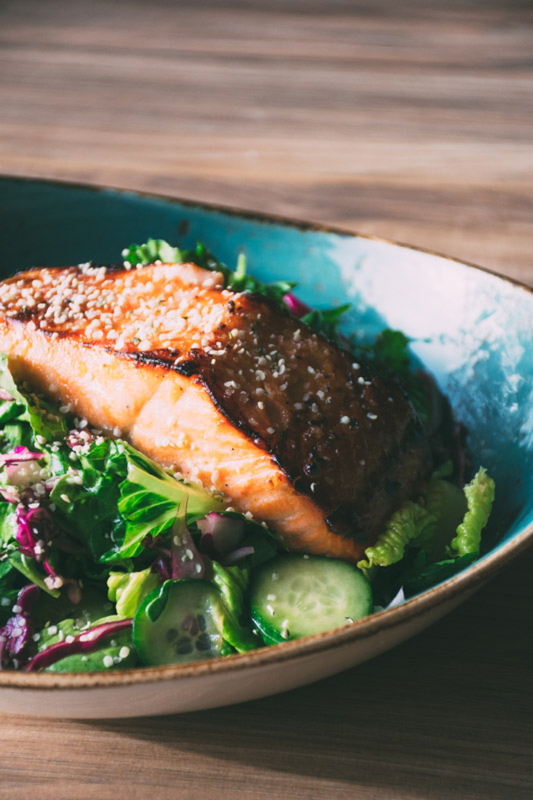 toss salad with vinaigrette, top with salmon, and garnish with a sprinkle of sea salt and either hemp hearts or sesame seeds. This entry was posted in dinner, lunch, salads and tagged easy, easy dinner, gluten free, healthy, salad on April 16, 2016 by Nyssa Tanner. Sharing this one with the Mama Bear! My folks will love this!! Looks so yummy. Can’t wait to try.